Today morning, I have seen one new notification in Taskbar. It is a warning with a message "Consider replacing your battery" and the description with this warning is "There is a problem with your battery so your computer might shut down suddenly". 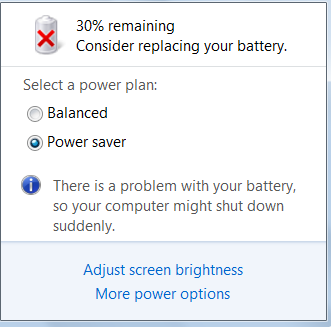 In addition to this error message, I see one cross mark on the power cell icon and noticeable reduction in its life. To learn more about this new error, I opened Windows Mobility Center but there too the same message displayed. To launch Windows Mobility Center. follow the link below. Fix for "Consider Replacing Your Battery"
To get the latest firmware you should go to the BIOS manufacturer's website. To improve the battery life, you should know when to charge it. We must know the nature of Lithium based cells to keep it healthy. Most of the notebook cells are lithium based. To know more about how to keep it healthy for a long period following the link below. If you forget the BIOS password and looking for a way to reset it, follow the steps provided in the link below.